For the second week in a row, Mr Liquor at Circular Quay had something new on his shelves – but the origins of this German Pilsner are a little unusual. Now normally when an odd European lager appears in Mr Liquor’s fridge, the standard BotF line is that a container of something weird has landed on the beach whilst Mr Liquor was walking past and we benefit. Or maybe a rep’s offloaded a sample of something discontinued or mixed with another delivery. To date I’ve only ever seen Cisk Lager or 250ml San Miguel stubbies brewed in Barcelona on Mr Liquor’s shelves – nowhere else. The price is also normally very sharp ($13.99 or even $11.99). 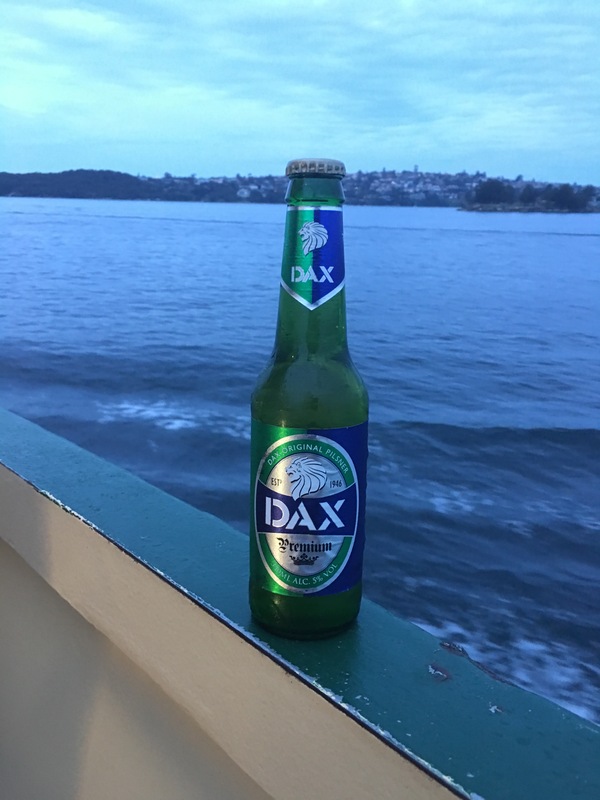 So when I grabbed a 6 pack of Dax Original Pilsner with its generic packaging and I read it was made in Germany, I thought “Mr Liquor’s done it again – another obscure Euro brewery with an innocuous malt bomb. $19.99’s a little steep though”. It was only when I looked up the website to see the provenance of the beer and/or brewer that things got interesting. It turns out that a family of Australian grog merchants that have been around since 1946 (hence the “Est 1946” on the label) have decided to launch their own beer to respond to a need they’ve identified. “He also realised Australian’s (sic) are getting tired of drinking international beer brands which are brewed in suburban Australia and paying a premium for it.” The “He” is Rex D’Aquino and so he’s enabled Australians (that’s better) to pay a premium for a beer brewed internationally for drinking in suburban Australia. 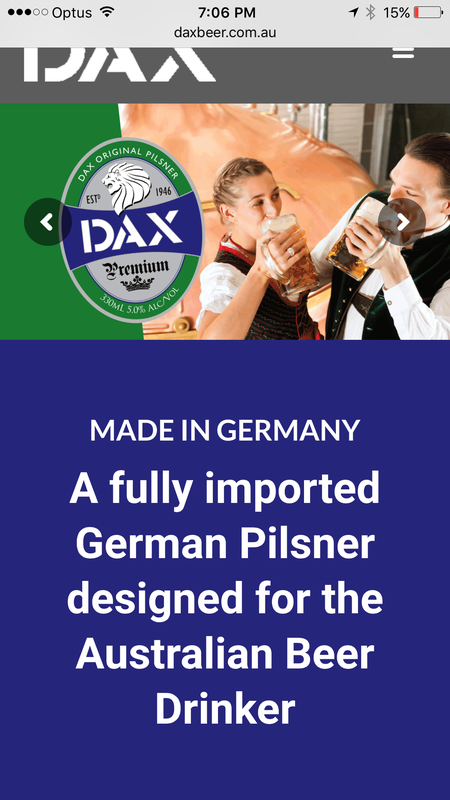 And as their website points out – Dax is not a Craft Beer. At $19.99 it is at a premium given other Euro labels in Mr Liquor’s fridges are often around $16.99 (and Holland Import is $7 for four cans, but that’s another story). 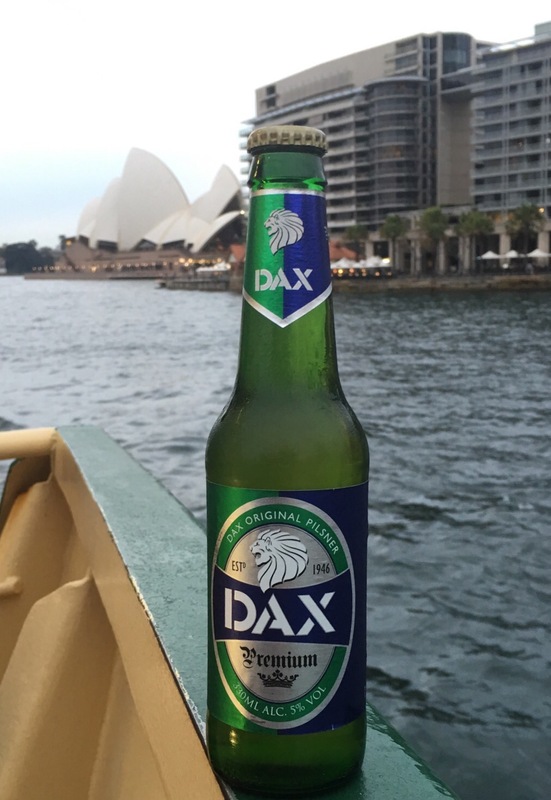 Dax or DAX is not a bad beer. It is very malty and Euro lager in style. Good for the Back of the Ferry as it warms up, but I’ll probably always opt for the Cooper’s Pale now that I’ve ticked DAX off the uniques list. Cheaper, Australian and a 375ml stubbie as opposed to the Euro 330ml.